A while back a friend of mine asked me why I spend so much time chatting with my on-line friends when I could be out with my local friends. An interesting point of which I was quick to respond by saying I'd do anything to spend face to face time with my on-line friends like I do with my "in person" friends. And to be clear, while I do spend a fair bit of time chatting with my on-line friends, I am not short of face to face interactions. I have a great group of friends, and a wonderful family. I am very well loved by many. However, my on-line friends, in many cases are also my REAL friends. I think of someone like Kristen Wideen,who up until last week I had never met face to face yet we have had hours of phone conversations discussing the great and not so great things going on in our lives. She understands some of the struggles I'm dealing with that my face to face friends don't quite get. She is a REAL friend. And she's not the only one. There are many that I talk with regularly and who are there for me in the good and not so good times and I hope they know that I am there for them too. They push my thinking and I am very thankful for that. There are a ton of these people that I would LOVE to meet face to face. It's actually a bit of a mission of mine, to meet these "virtual" people in "real" life. This past week, while on Spring Break, I made the effort to meet some of these people. 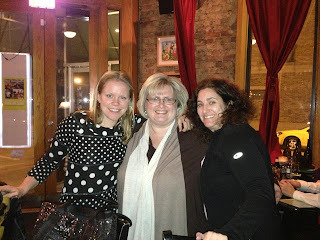 During one of my weekly #1stchat talks I realized that both Laura Komos, and Kristin Ziemke were going to be in Chicago at the same time. Chicago has always been an American city that I was curious to visit, but to be honest I figured it would be to run its marathon. My running has taken a downward spiral the past few years though so the thought of running another marathon is a bit too daunting at this time. From the moment I stepped off the plane and into O'Hare and met a bright green haired lady in the airport (Chicago goes nuts for St. Patrick's Day), I knew it was going to be a great adventure and that it was. I met Laura and Kristin, and to my surprise (a wonderful surprise) Joy Kirr from #geniushour too. 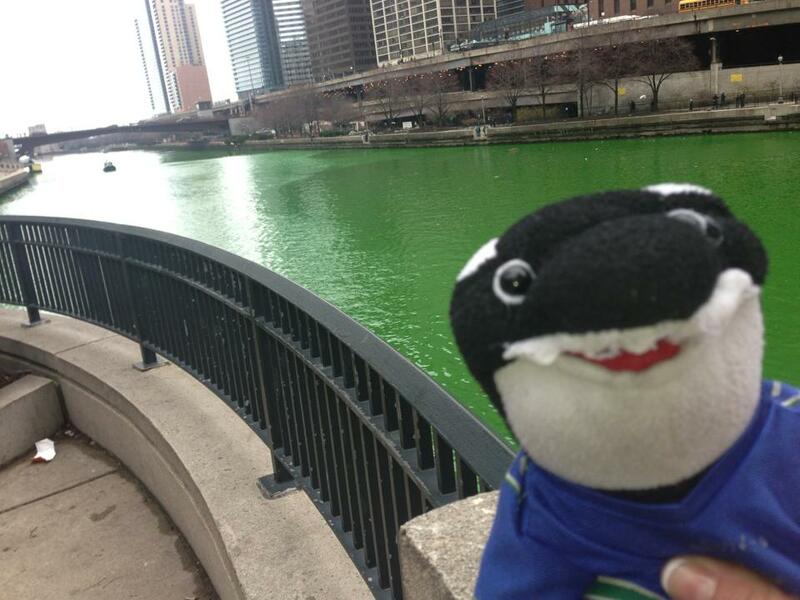 She saw a picture I tweeted of Fin (the Vancouver Canucks Mascot) at the green Chicago River and immediately asked if I was in her town. 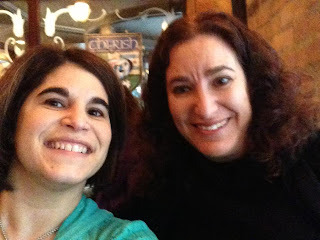 I also met Theresa Allen, one of the teachers I met in the Flat Classroom Project I was involved with last spring. 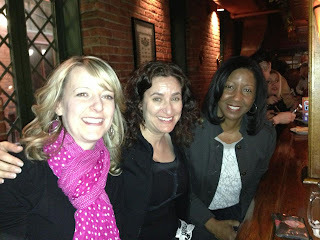 I even crashed the ASCD Conference tweet up. The face to face time with these incredible ladies was more than I could have asked for. Their generosity was over whelming and I felt very loved. We had great conversations and at the end of each visit it was with sadness that we separated. They happily let me into their lives. In fact Kristin let me into her home and her classroom* too. And just think less then 20 months earlier I had no idea who these ladies were. From Chicago I flew to Detroit to meet, for the first time face to face, Kristen Wideen. 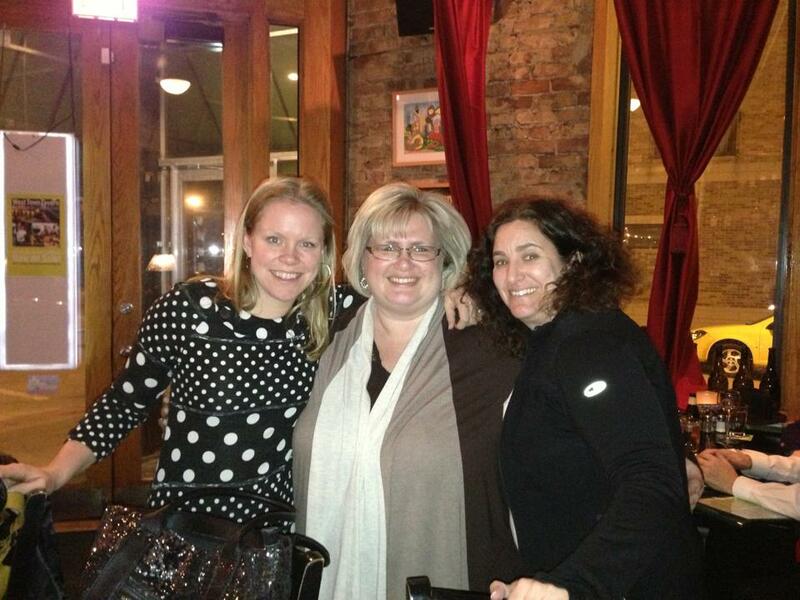 But before I left Chicago I noticed a tweet from Val Ruckes the co moderator of #1stchat with Laura Komos. She was in Detroit for a conference! DMs went flying and as soon as I landed in Detroit with Kristen waiting to pick me up at the airport with the wonderful @MrWideen we headed for dinner with Val. I spent a wonderful weekend with Kristen and her family. I stayed in her home and I spent a day in her classroom*. We had many, many conversations about so many different things. It was as if I had known her for years, even though the first time I met her in person was at the airport in Detroit. Crazy right? But that's the thing with Twitter. If you put yourself out there you will make meaningful connections. I can assure you I have meaningful connections with the people I spent my week with and the fact that they live no where near me and up until this week we had never met face to face is irrelevant. Unfortunately while I was away things weren't as wonderful back at home. There were two family tragedies with the death of my aunt (Mom's sister) and my uncle (Dad's brother). And as supportive as my friends were, it was really good to be back with my family when I returned. So now what? 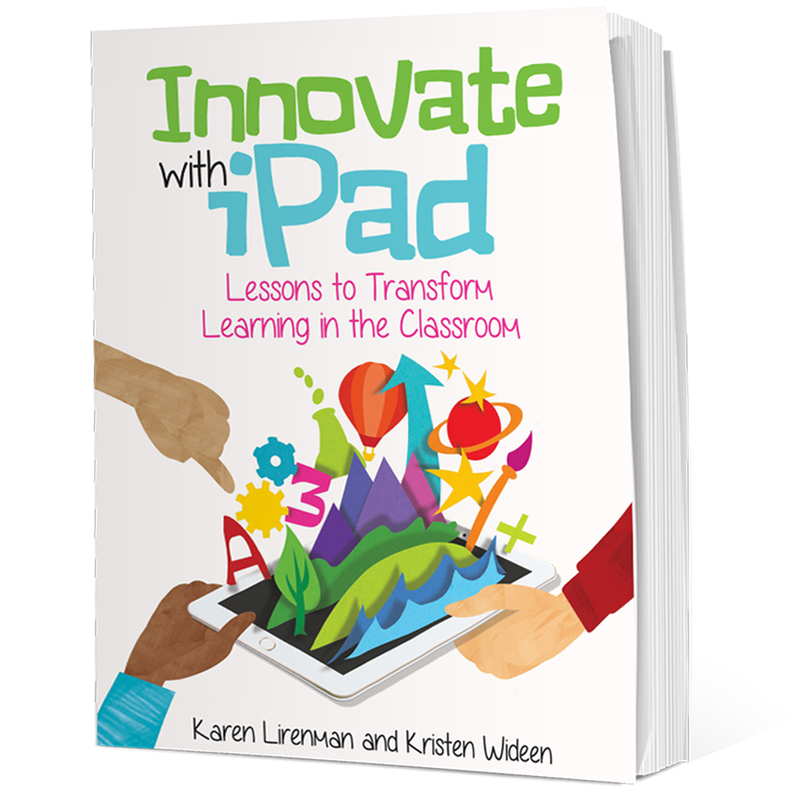 The lucky thing for me is that Kristin and Kristen have also been selected into the Apple Distinguished Educator Class of 2013 which means we will get to spend a week together this summer at the Apple Institute in Austin. 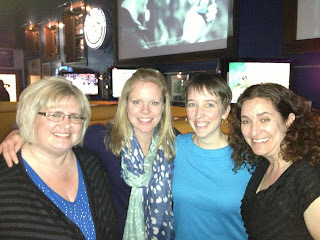 And of course it has me wanting to meet more of my twitter peeps face to face. I have no idea who I will meet next but I do know there will be more face to face meetings in my future. *Yes I will blog about my visits to Kristin Z and Kristen W's classrooms and schools. For certain my friend, for certain. Karen, it was so exciting being able to meet you so close to my home! Bob and I loved the excitement of the night, and I think it's great that you made a point of meeting online friends for your trip! See you next time I'm in B.C., whenever that may be! Karen, I always love going to visit other classrooms as well. 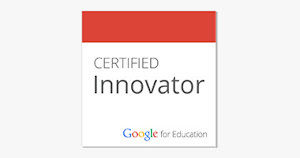 I think that this can be one of the best professional development opportunities for teachers. You can learn a lot seeing how other people do things, and then deciding how you're going to tweak their activities for your students and their needs. 1) What new things are you going to try now? 2) What might you adapt before you try it? 3) What questions do you have after visiting these different classrooms? Just today I wrote this blog post which talks about some of the things I saw in their classrooms. To be more specific here are some answer to your questions - I'm sure there are many more too but this is what I have to give this evening. 1. Already this week my students used Today's Meet to make connections/predictions as I read a story. Plans are already in place for next week to be using this platform to discuss a book with Laura Komos' class in Illinois. I loved how Kristen W let her students free to document Flat Stanley's adventures. She had different students blogging each day. This week we've done the same thing. Both Kristin, and Kristen used QR codes to to quickly get their students into Today's Meet. I did too and they loved it. I am skeptical about using QR codes to scan math problems, or to run around a school on a scavenger hunt, but creating a room in Today's Meet, quickly making a QR code so that my students can scan their way in was a great way to use them. I love the home/school project Kristin sends home nightly with a different school. I need to find one that works well with my school community. I want my students and I to use a green screen with iMovie. While I did not see Kristen W use it while I was there I know she has used one before. I've since put up "green paper" in the hallway and I will figure it out and have my students involved with creating something with it. Just having the green on the wall is a start right? I shared some of the tricks that poets use that Kristin Z shared with her class, but I am realizing that our poetry study needs to follow our non-fiction animal study. Despite the fact that April is Poetry Month, it is too much for my students to write informative Non-Fiction animal reports and write creative poetry well at the same time. 3. A lot of questions running in my head are BIG in nature. The more I visit schools the more I realize how important school unity and vision can make or break you. It's interesting to see the good and not so good others go through too. It made me appreciate a lot of what I do have (like smaller class sizes, and great learner support for my students) but also clearly showed me many of the areas of weaknesses within my school that affect me. Not so much a question as much as reflection but I have reflected on what I do differently and why it is important to me. My pedagogy is quite clear and I understand why I do what I do. That does not mean that it can't be changed, but my focus is clear. But the biggest question I have is what trouble can Kristin, Kristen and I get into with our classes? I am so thankful that we have all been accepted into the Apple Distinguished Educator Class of 2013 and that we will have time to collaborate together this summer in Austin and I can't wait. As always, thanks for pushing my thinking.